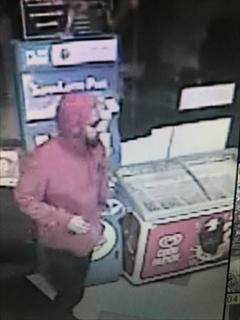 Sacramento Police are investigation a series of armed robberies of a single convenience store they believe were committed by the same suspect. Starting on Saturday April 15, police believe the same suspect has robbed the AM/PM store located at 8880 Fruitridge Road on three ocasions. Each of the robberies were committed between 8:30 and 11:30 p.m. and occurred on April 15, 18, and 24. In the robberies, the suspect, (pictured below) enters the business and approaches the clerk demanding money at gun-point. In one of the incidents, the suspect fired the gun into the ceiling. There have been no injuries associated with the robberies. Once the robberies were complete, the suspect fled the area on foot. 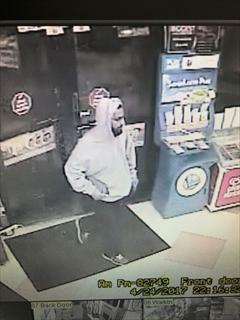 The suspect is described as either a white, Hispanic or Middle Eastern, male, approximately 30 years old, 6’0” tall, medium build and a dark beard. He is seen wearing a variety of different clothing in each incident. The Sacramento Police Department encourages any witnesses with information regarding these robberies to contact the dispatch center at (916) 264-5471 or Crime Alert at (916) 443-HELP (4357) or submit an anonymous tip using the free “P3 Tips” smartphone app. Callers can remain anonymous and may be eligible for a reward of up to $1,000. 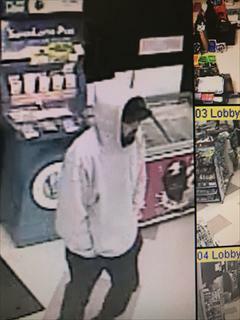 No Comment to " Armed Gunman Suspected of Robbing Same Sacramento Convenience Store Three Times "